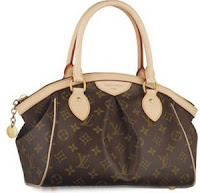 To your right is the Louis Vuitton Tivoli PM bag. It will be the next handbag I purchase, especially since I apparently missed the boat already on the Kooba bag that was specially designed for an HSN segment co-promoted by Lucky magazine. The TV event starts on Friday but it looks like it's already sold out online...(sigh) if only everyone else had bad taste. Speaking of bad taste, I noticed today that everything I ate today left a bitter aftertaste in my mouth (Cheerios -- bitter. Strawberries -- bitter.). I was getting worried since I recall hearing (from a marketing person, not a doctor) that one sign of brain tumor is altered taste perception (although I think she said something like you could taste colors, or maybe she was talking about a different experience altogether). Anyway, I went to my Primary Care Physician (the Internet), and found a forum where people posted about the same symptom -- and they had all eaten large quantities of pine nuts! Flashback to Monday night -- my daughter and I chowed down on a bag of Costco brand pine nuts after dinner, squirrel-style. Apparently this can last for days -- like possibly five or so days. Back to the Tivoli. I actually went to the LV store to try it on, and I LOVE it (especially after my friends were selling me on how practical it is -- "I spilled a Tall Latte on it and it wiped right off" or "Your kids can drop an ice cream cone on it and it comes right off") except that you can't put it over your shoulder. Well, here's the screwy part: I LOVE how bags look when you can't put them over your shoulder, because I like the look of satchels, but I always try to put a bag over my shoulder (two kids), so I fear its impracticality. However, I tried on the GM version which you can put over the shoulder, and it's not quite as cute and is a tiny bit too ginormous for me. This is why I don't yet own a Tivoli. Or do I need both? You need BOTH!!! Coming from the person who purchased a small YSL Downtown Tote and now is about to purchase the same bag but in a larger size.